Thank you so much for this! You are awesome! This is such a heaven for me! I have downloaded the starter pack and wow! I can't thank you enough! I am not a new arashi fan, I've liked them since 2002, but its quite difficult to find their videos especially with english subs. I've been desperately looking for international fans I can connect with Arashi. After years of searching, thank God I finally found you and all the wonderful fans here in LJ/DW. Being a fan for so long, yet I still get hyped watching them. Keep it up dearest! You have my support! Seriously, as a new fan I feel blessed by this post! I find myself coming back to it again and again and every time I find something new. It is truly the ultimate starter pack. Thank you so much for your hard work! Here and every other community you are involved in (I keep seeing your name like everywhere). It is because of fans like you that the international Arashi fandom is alive for us new fans to discover. Thank you so so much for this incredible and helpful guide!! I think that i am still new in the Arashi fandom because i just starting to get into them like from October or November last year and Arashi is going to celebrate their 20th Anniversary soon, so, i think i am still new into the fandom! This guide is helping me in anyway to search Arashi videos and getting into them more! Thank you so much too for the starting guide folder~~ ! So sorry if my question is already in your list up..
but do you know where i find a list of episode of Arashi ni Shiyagare where they start a death match? because i want to collect death match series.. i love it so much..
You'll find a guide here. 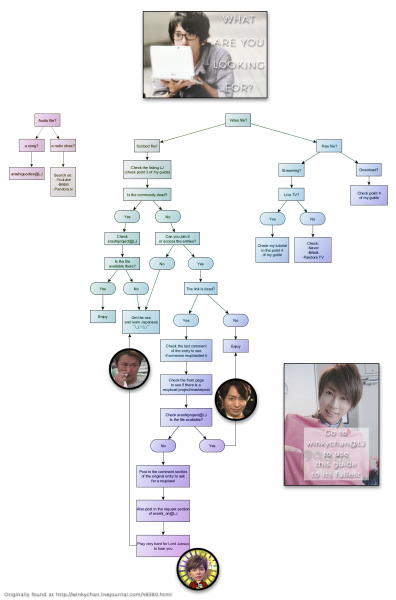 I got back into the Arashi fandom this year so this guide was very helpful. Thank you! As a fan coming back from hiatus from 2012, this was SO helpful. Thanks for all your help in the fandom. I'm loving your journal each time i click a post. Even though i've liked them for a long time, this post is still so helpful for someone like me who had a break. the flowchart is what i love the most. Thank you, your journal shows sincerity!